This unique retreat rests serenely on Lake Sawyer, where the grass goes right to the water's edge and is a sanctuary for your senses, with spectacular lake and Mt Rainier views, all behind a private gate. It is a fantastic place for you and your family and friends to play and recharge, so much that you will not want to go home. You will be right on the water, the lawn flows right down to the water, where water toys are accessible to the lake. This lakeside retreat with awesome views is a perfect place to get away for a relaxing stay - this waterfront oasis is just over two thousand square feet of fun and relaxation, with FOUR bedrooms with FIVE BEDS (PLUS TWINS) and two main baths and a half bath upstairs. The lake access area features a spacious deck to soak up the sun, take a dip in the lake, or catch fish off shore (the lake gets a summer stock of trout and a famous bass hole is right in front of the house) with a fire pit by the water. This unique property is close to conveniences, like Costco and Walmart, yet private and secluded from the noise and congestion of the city. 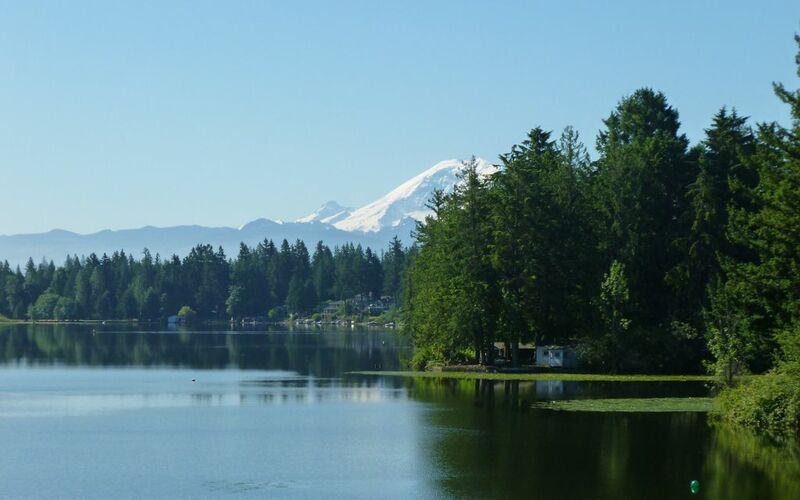 We are in the town of Black Diamond, which is adjacent to the City of Covington and due east for SeaTac International Airport, nestled in the foothills of the nearby Cascade Mountains. The property has an open floor plan with access to the party deck with only a few steps to the water. As the deck is covered rain or shine it is the perfect place to read a book, watch the fishermen or the wild geese or grab a canoe or kayak or paddle boat and go fishing or play on the water. The wildlife comes right up to the deck, the kids love to feed the ducks, but when that becomes too much, just put up the plastic fence and they stay out of the yard. They are not trained, but it just seems to work. We have water toys for you to use as long as you agree and understand that we require the use of our many life jackets as safety is most important. MAJOR REMODEL: WOW AND IT IS AWESOME….We tore out the carpet on the main floor and installed taupe Pergo – we demolished the cabinets and counter and installed new white shaker style cabinets with exquisite – white quartz counter tops with an overhang bar. We installed new trim, raised baseboards and crown molding and installed new stair railing with iron pickets. We change a small tub shower combo in the main floor full bath into a walk-in shower with stone work and glass doors. Many other changes were made as well but no need to brag, and we gave away the sofa and love seat and put in a new sectional. The MAIN level features a spacious great room, with a stone-faced gas fireplace with a 55' wall-mounted flat screen TV with Xfinity Comcast cable complemented with comfortable sectional and bar seats and large dining area that seats 10 with large picture windows. The glass doors open to the lake and provide access. The house is perfect for entertaining and allows you to cook to your heart’s delight in the convenient kitchen or on the deck BBQ and enjoy dinner lakeside on the deck. The UPPER level features TWO private QUEEN BEDROOMS, BOTH w/ lake view – a getaway unto itself, one with a private deck. The loft features a foosball table and air hockey, as well as sleeping space, and a half Bathroom. The second bedroom (Queen size bed) and third bedrooms (Queen Sized Bed) both with amazing lake views. More can be accommodated utilizing the loft area with extra twin beds or inflatable beds. Use the open space in the great room to accommodate more. There is also a washer and dryer. New Stainless Steel Dishwasher and Oven and Range....Enjoy Comcast TV in the Great Room. BEDROOM #1: (1 QUEEN SIZED BED). This is a bedroom that is light and open. The bedroom is upstairs and has a spectacular view of Lake Sawyer and Mt. Rainier peaking over the trees and greenery, with a backdrop of the hills and trees in the distance. Truly breath-taking. For your privacy just close the new designer shutters and the room gets darker. There is a ceiling fan and summer fan when it is warm or just use the central air conditioning. This room has a queen bed next to a sunburst window. BEDROOM #2: (1 QUEEN SIZED BED). This bedroom is also on the top floor and has a view of the lake with a private deck. This room also has a queen bed with a pine frame and pine chest of drawers.. BEDROOM #3: (1 QUEEN SIZED BED). This is the main floor Suite with a queen bed and private full bath. BEDROOM #4: (2 FULL SIZED BEDS). This is the largest bedroom located on the entry level. It has French-style doors that open right out to the lakefront, with a private patio. This room has 2 full-sized beds and extra twin mattresses. There are plenty of linens for the extra Twins in the linen closet. LOFT: (TWINS). There are two twin mattresses ready to use in the loft, just outside the two upstairs bedrooms. All the bedrooms have flat screen TVs and Comcast Xfinity Cable, as well as WIFI connection to the Internet. RV Parking – YES -- The driveway is long enough that you can back in your RV right through the gate and back it up to the door. Even after that there is room for several (probably 7 more) other vehicles. For those returning you will love the changes, but we keep the comfortable feel. This home is privately owned. NO SMOKING/Sorry NO pets... Must be at least 25 years old to rent… The house can sleep up to 10 – 12 guests. We have had up to 13 guests stay. CANCELLATION POLICY: YES WE HAVE ONE… VRBO WANTS US TO PUBLISH IT IN THIS DESCRIPTION – $500.00 AND THE VRBO FEES ARE ALWAYS NON-REFUNDABLE. OTHERWISE, IF YOU CANCEL UP TO 120 DAYS PRIOR TO ARRIVAL ANOTHER $500 IS NON-REFUNDABLE AND THE BALANCE IS REFUNDED TO YOU – THEREAFTER ONLY $500 IS REFUNDABLE. (There are exceptions for deaths and major issues). We will upload a new video once construction is complete. BARBECUE GRILLS are optional, PLEASE LET US KNOW IF YOU WANT TO USE ONE SO WE CAN BRING OVER A TANK. You are asked to provide the propane, we offer what is in the tank and you are responsible to refill what you use. We changed out the large barbecue grill for two grills that equal the same surface area but allows you to cook different food at variable temperatures, please refill it if you run out if it. We are 45 minutes from downtown. On January 2, 2017 I have commenced managing this property and am excited for this opportunity to provide quality vacation rentals for our guests - I'm Pam if you have any questions just email me directly. Ken is the builder and is available to assist if you need help. Our family purchased this home and just love to spend time here. But we have an active family and are not able to be here all the time and want to allow others the same opportunity. This property is unique. It is magical to sit in front of the fireplace reading a book and watch the sunrise. Then catch a fish right of the lake side or just relax. Then take your boat or your jet skis around the lake then to return to roast marshmallows on the fire pit. This is the relaxed life you deserve. We came to Washington to visit our extended family and Pam's house was perfect for us. We had 9 people staying most nights comfortably and could have slept 1-2 more. our kids loved the foosball and air hockey tables and the scenery was fantastic. I would recommend this house for any larger families looking to hand out together in one place. We enjoyed an extended stay at this home while we were having work done on our home nearby. The owners were very accommodating with us, as our project took longer than expected and we extended our stay. It was great to see what lakeside living was like. They had several kayaks, a canoe and a paddle boat available, which was really nice! The kitchen was well stocked with all our cooking needs. Lovely covered deck for outdoor dining, with a grill. TVs in all of the rooms were a nice bonus. They returned my full deposit very quickly. The best part of staying there was looking out at beautiful Lake Sawyer. The house had plenty of room for our family of 6. The house needs some TLC in some areas, but you can see that updates are being made throughout the house. Overall, I wouldn’t hesitate renting this house again in the future. Thank you! Great House on the Lake. Overall I enjoyed my stay and would recommend this house for anyone that wants a house on the lake that can sleep up to 12-13 people. Owners are very responsive and we had only minor issues that were easy corrected. Right on the beautiful lake and plenty enough space. Went with a group of 9 for a Softball tournament. Everyone enjoyed relaxing outside in front of the lake and hanging out inside eating and watching the game. Highly recommend this spot! The hosts seemed responsive to anything we may have needed, which we did not. We would rent again and would recommend it. we had a nice time with comfortable beds for the 9 of us. and many enjoyed paddling out on the lake with the kayaks and paddle boats provided. quiet neighborhood and 10 minutes to good thai, pizza, and farmer's market. host was quick to respond when i needed check-in info and had questions about our deposit being returned.